Many of the candidates are showing their eagerness in taking the Gujarat GK Quiz. So, aspirants come and join us to know more about the concept and the information of Gujarat. Candidates who are attempting many competitive exams should have a glance at the information about the concept and need to be efficient in that particular area. So in the below post, we will assign the candidates Gujarat Quiz which is an online test. Thereby, the candidates can attempt the Gujarat Online Test easily. This post, Gujarat GK Questions and Answers ensures that the detail description and the queries asked by us are providing with suitable options, and the answer will be displayed as per the submission of the exam. 1. Which is the largest city of Gujarat? 2. Which is the largest city in Gujarat? 3. How many districts are there in the state? 5. Who is the Governor of Gujarat? 6. Which state is North of Gujarat? 7. Which one is the first European power to arrive in Gujarat? 10. Which sea is to the west of Gujarat? 14. Which river flows through Surat? 15. Which king of Gujarat is compared to the emperor Ashoka? 17. What is the area of Gujarat? 18. Gujrat is bordered by .... state to the south. 20. When was Gir Forest National Park & Wildlife Sanctuary established? The questions that are present in the Gujarat General Knowledge Questions and Answers are related to the concept of the state as well. In Gujarat Gk Questions, there will be related options with one accurate answer that is comparatively stable to that particular question. Meanwhile, you start the quiz let us learn more about the state of Gujarat. Gandhinagar is a planned city. The Sabarmati, the largest river in Gujarat followed by the Tapi, although the Narmada river also covers the longest distance in its passage through the state. Many communities, however, include seafood, chicken, and goat in their food diet. The typical Gujarati thali consists of roti, dal or kadhi, rice, and Shaak/sabiz. The Gujarati’s are known for their diverse culture and their rich traditions. This state is a vibrant mix of the Hindus, Islam, Jainism, and Buddhism, and also there are different cultures like arts, traditions, lifestyles, institutions, inventions, and technology. Also, check the below points and know the Gujarat GK Quiz. Candidates can learn more about the Gujarat state and also the culture and tradition that they follow. Aspirants will not only know the brief description of the state but also they can know their level of presence after attempting the exam. Furthermore, they can accomplish the knowledge by practicing their quiz online test many times. To get good knowledge and also to be efficient, they need to study the concept that is been described. After the completion of every exam, we will offer you the marks that what you have scored the test we provided. Based on the exam that they have attempted, the candidate can rank themselves. Hence they can again attempt the test immediately without any disturbance and confusion. 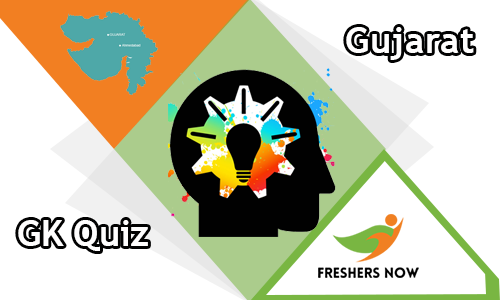 Moreover, for more Gujarat GK Quiz details and information you should follow our site Freshers Now constantly.